Founded on land called Menunkatucket by the Quinnipiac Indians, Guilford’s first settlers arrived in 1639 and, as was so common to American homesteaders, renamed Guilford after their original hometown in England. Today, historic buildings from that time and all the centuries that followed remain a fixture on the Guildford landscape, including five residences that are now museums curated by such organizations as the Guilford Keeping Society. Among them is the Henry Whitfield House, built the first year of the town’s founding and thought to be the oldest in the state — and perhaps the oldest stone house in North America. And today, the heart of this charming little village continues to be Guilford Green. Placed on the National Register as a Historic Town Center in 1976, the Guilford Green, which is surrounded by as many as 500 protected historic buildings, is where nearly all explorations of Guilford begin, and the development of the Village Walk plan makes these byways even easier to navigate. Beautifully framed by three churches, the Green is fringed by Colonial, Federal, and Victorian buildings that house its retail and commercial enterprises — many historic in their own right, including Page Hardware, which has been in business there since 1939, and the Guilford Food Center, where both the front sidewalk and the wooden floor within are swept like clockwork every morning and where you can still pick up hot chowder any day of the week. Ready to shop? Newer retail shops include M!X Design Store, one of the best gift stores on The Shoreline, and Lulu’s for clothing and jewelry and all sorts of other goodies — both on Whitfield Street. And on Church be sure to find PaperScape artworks; Onyx, a wonderful clothing boutique; Creek Chic Designs, for handcrafted jewelry and belt buckles; BSK Design; where those who love art glass will swoon; and Chroma — home of three businesses, offering one-of-a-kind jewelry, fused glass, handcrafted paper and artwork, clothing, accessories, and gift items. And if practical matters arise, like getting some great shades or having your one pair of reading glasses repaired, head for Guilford Optical Shoppe on State Street. At the southern end of the green, Whitfield Street — so named for the Henry Whifield House you’ll see along the way — continues seaward toward Guilford Harbor and Jacob’s Beach. Near Whitfield, you’ll spot signs for the “designated scenic highway” that begins at the end of Boston Street. 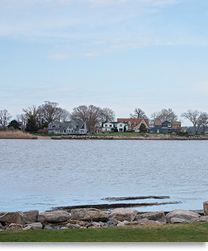 And Water Street, or Route 146, heads west from the Green for a 12-mile run through Guilford and Branford to the scenic neighborhoods at the edge of the Sound. The secluded public park at Chaffinch Island is ideal for a leisurely picnic lunch. And be sure to take a wander through the warren of lanes that dip and twist through Sachem’s Head. Search for Lost Lake in the forest in Westwoods, also off 146. And not far from that parcel is Medad Stone Tavern. If you pick the right day, you might get a hearth-cooked meal there. Not far off the green on River Street is West River Park, where the daydreamers among us will find the stream’s bank a good place relax. Head north to the Boston Post Road, then west, and you’ll find yourself at the Bishop Family Farm and Orchard, which was established in 1971 and now features a winery, as well as produce and fruit. Scenic highway 77 also begins at the Green. Near its south end is the Guilford Art Center, home to a delightful gallery and shop, as well as multiple artist studios and classrooms. And heading northward, about 11.5 miles on, is the Durham town line, and a country ride past farmsteads and nurseries, with stonewalls and pastures enclosing horses, cows, and even llamas. A few miles north lies Dudley Farm, an historic spot with its 1840s farm house, where the public is warmly welcomed to its seasonal Saturday-morning farmers’ market — and to bluegrass jams beneath its maples.